With its innovative Soundboard Speaker System, Ultra Progressive Harmonic Imaging sound technology, and new RM3 wooden-key action, the Kawai CA93 is simply the finest digital piano available. The experience of playing the CA93 is one of ultimate satisfaction and inspiration, even for the most accomplished pianists. Featuring the latest Ultra Progressive Harmonic Imaging sound technology, the new Concert Artists offer the most detailed acoustic portrait of any digital piano, with 88-key piano sampling ensuring smooth tonal transitions across the keyboard and throughout the entire dynamic range. 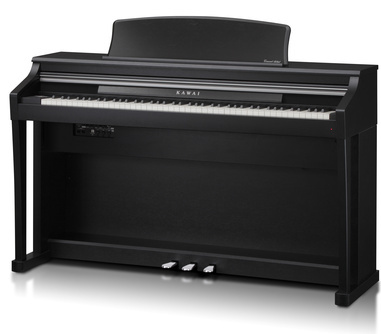 The new Concert Artists also introduce RM3 Grand – the most realistic digital piano keyboard ever developed – with finely textured Ivory Touch key surfaces further enhancing KAWAI’s unique wooden-key action technology. 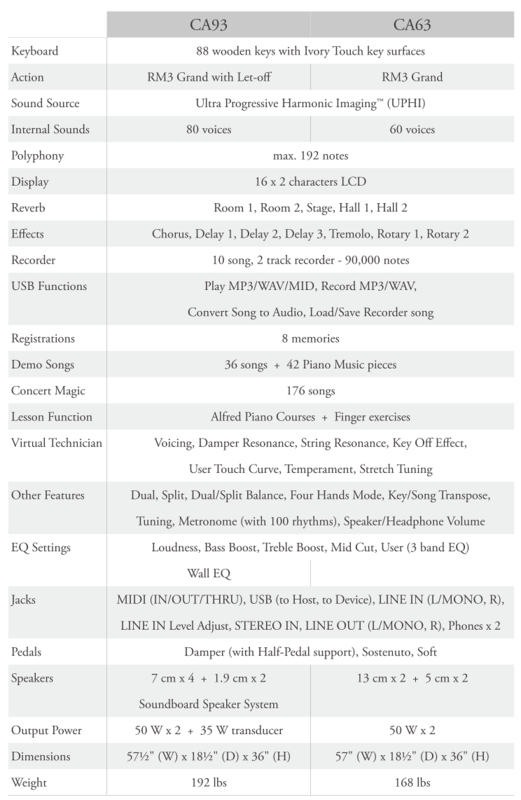 Finally, complementing these impressive advances in sound and action technology, the convenient USB Audio feature allows music files stored on USB memory to be played through the instrument’s speaker system, or for memorable performances to be recorded directly to MP3/WAV without leaving the keyboard. The touch and tone of an acoustic grand with all the features and convenience of a digital: all new Concert Artists from KAWAI – the future of the piano. The KAWAI EX concert grand piano is widely regarded by professional pianists and piano technicians as the finest instrument of its class. Hand-built by our distinguished Master Piano Artisans at the Shigeru Kawai Piano Research Laboratory in Ryuyo, Japan, each EX instrument undergoes a meticulous regulation and refinement process within a specially designed anechoic chamber. Following this lengthy preparation period, the completed EX piano receives a final series of rigorous quality inspections, before eventually taking pride of place on the centre stage of the world’s most prestigious musical institutions and concert halls. The beautiful sound of the EX grand piano is at the heart of the new Concert Artist, with all eighty-eight keys of this world-class instrument painstakingly recorded, analysed, and reproduced as high-fidelity digital waveforms. Recording each key individually in this way – as opposed to stretching the same tone over several different notes – ensures that the rich harmonic character of the original EX grand piano is preserved, and guarantees that the sound heard when pressing any one of the Concert Artist’s wooden keys is a faithful representation of the acoustic source. When playing the piano, the amount of pressure applied to the keyboard not only affects the volume of the sound produced, but also the unique tonal character of each note. Therefore, in order to gather a realistic acoustic portrait of the EX grand piano, not only is each key recorded individually, but also captured at various different strengths, ranging from gentle pianissimo to thunderous fortissimo. The new Concert Artist offers the most detailed acoustic portrait of any digital piano, with Ultra Progressive Harmonic Imaging sound technology ensuring smooth tonal transitions across the keyboard and throughout the entire dynamic range. The keyboard action of an acoustic grand piano has remained largely unchanged for centuries, employing long wooden keys that rise and fall in a seesaw motion, to trigger hammers that strike metallic strings. It’s an intricate, yet beautifully designed mechanism that allows pianists to express a wealth of feeling and emotion in their playing. The Concert Artist’s RM3 Grand action embraces the very same, long-established acoustic piano principles of material, motion, and mechanism to faithfully recreate the exceptional touch of a fine concert grand. First, all eighty-eight black and white keys are crafted entirely from long pieces of wood, with finely textured ivory-like surfaces applied to absorb moisture and assist control. USB memory devices can be used to play back MP3 or WAV audio files, allowing musicians to learn the chords or melody for a new piece, or to simply play along with their favourite songs. It is even possible to save performances as MP3 or WAV files for emailing to friends and family, listening to on an iPod, or for further editing using an audio workstation. The final stage in reproducing the exquisite tone of the EX grand piano relates to the physical delivery of the sound itself. The CA63 features powerful speaker systems that provide deep, resonant bass frequencies and clean, crisp trebles. Previously, when the normal touch curve didn’t fit your playing style, the only solution was to choose one of the different touch curve presets in the piano. With the NEW User Touch Curve feature, you can CREATE your own touch curve. In User Touch Curve mode, you are asked to play dynamically from soft to loud to input your playing style. Then the piano analyses the data and creates the perfect touch curve specially made for you. Virtual Technician A piano technician plays a very important role for an acoustic piano to be in the best playing condition for a pianist. Our VIRTUAL TECHNICIAN function does the same work digitally. You’ll find Kawai’s exclusive Virtual Voicing, capable of digitally "voicing" the piano sound. There are also controls for adjusting the action’s Touch, String and Damper Resonance, as well as several other piano-specific settings. You can easily customise your Concert Artist piano’s initial settings. Choose a new starting instrument, favourite effect, touch curve, etc. Once you have the piano memorise it then you don’t have to go through many buttons every time you turn the power on. When you layer two sounds (Dual) or use different sounds on the left and right (Split), the balance control is convenient for quick and easy adjustment of the two sounds’ balance. Moreover, you can adjust the octave range of the second sound (Layer Octave Shift, Lower Octave Shift) in DUAL and also in SPLIT mode. Also you can set up the dynamic behaviour of the second DUAL sound (Layer Dynamics), to let you avoid having too high a volume on it. In Four Hand Mode you can split the keyboard in two halfs by having the same octave range on both parts. So two pianists (i.e. teacher and pupil) can play and practise together on only one instrument. For the aspiring pianist, the Concert Artist Series features a recorded collection of standard practice and warm-up drills, with a companion music book containing major and minor scales, arpeggios and Hanon exercises also included. Moreover, the powerful lesson function allows performers to learn the piano using a built-in collection of etudes from Czerny, Burgmüller, Beyer and Bach, or songs from the popular Alfred Basic, Adult and Premiere (USA, Canada, Australia and UK only) course books. Each etude or song can be played at various tempos, practicing the left and right hand parts separately, before eventually recording a practice session for self-evaluation. Five distinct reverb types simulate listening environments from private practice rooms to concert halls. Two special reverbs produce a 3D effect, surrounding you with sound from all directions. Digital sound effects such as delays (three types), Chorus, Tremolo and Rotary Speakers (two types) add to the remarkable realism of the Concert Artist sounds. You can adjust the digital effects and - for further use - save. In addition to the standard metronome click you can choose from 100 drum rhythms for your convenience on all three new CA models. Play along with a complete drum set. You can load various rhythms and change their tempo. Never before was practising so much fun.